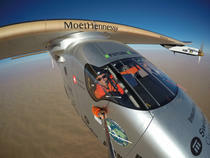 Borschberg heads for Cairo as solar-powered airplane resumes its around the world journey back to Abu Dhabi on the 16th leg of its record-breaking flight to demonstrate the potential of clean technologies. The sun-powered plane Solar Impulse 2 (Si2) landed in New York on Saturday, flying past the Statue of Liberty before landing at John F. Kennedy International Airport to complete the final leg across North America on its history-making journey around the world without using a drop of fuel. © 2018 Global Newsroom. All Rights Reserved.